Dr. Ing. Rainer Martin is a Professor of Information Technology at Ruhr University and Head of the Institute of Communication Acoustics, Bochum, Germany. His research interests are signal processing for voice communication systems, acoustics, and human-machine interfaces. He has worked on algorithms for noise reduction, acoustic echo cancellation, microphone arrays, and speech recognition. 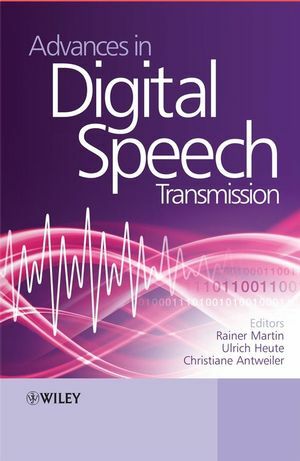 He is coauthor of the book Vary/Martin “Digital Speech Transmission”, John Wiley, 2006. Ulrich Heute is a Professor for circuit and system theory at Christian-Albrechts University, Kiel. His research interests include digital signal processing, filters and filter banks, and spectral analysis, with applications in medical, audio, and, especially, speech-signal processing (combined source and channel coding, enhancement, modeling, speaker characterization, and instrumental quality assessment). Christiane Antweiler is a senior scientist at the Institute of Communication Systems and Data Processing of the RWTH Aachen University. Her interests are the design and implementation of digital signal and speech processing algorithms for real-time applications, and her special focus lies on speech coding for cellular mobile radio and the enhancement of digital speech signals. Furthermore she is interested in algorithms for system identification, in adaptive filter theory and in digital signal processing algorithms for medical diagnostics.